Henri de Toulouse-Lautrec always harboured a keen fascination with the world of the theatres and cafés-concerts of Paris, which he depicted in numerous works, exhibiting his impressive powers of observation. The famous singer Yvette Guilbert (1867‒1944), a genuine star of the Divan Japonais, Ambassadeurs and Moulin Rouge cabarets in fin-de-siècle Paris, had met Toulouse Lautrec at the beginning of 1893 through the writer Maurice Donnay and had become one of the painter’s favourite vedettes. In this portrait, which was used to illustrate Gustave Geffroy’s article on cafésconcerts in Le Figaro Illustré in 1893, Yvette is depicted on the edge of the stage, in a stiff pose — haughty even — about to perform the de rigueur curtsey between rounds of applause. 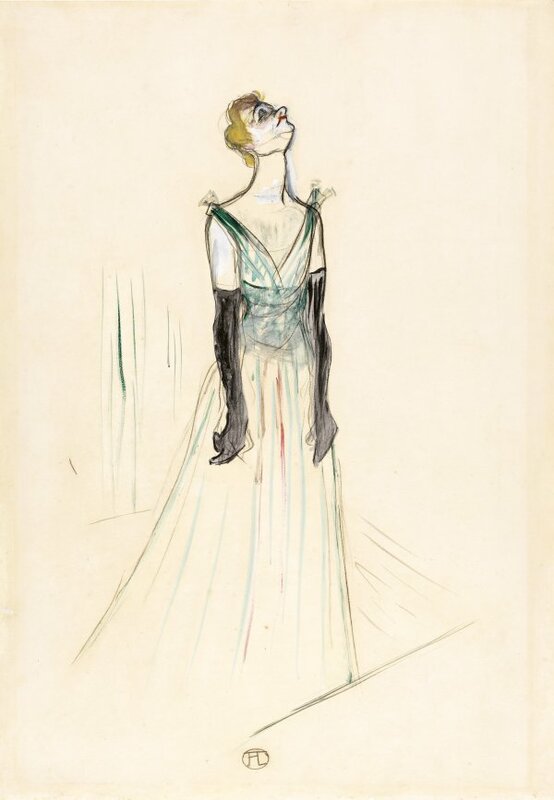 According to the singer’s memoirs, he had copied her chignon and pale makeup from a wax head in the Musée de Lille and her long V-necked dress from Albert Besnard’s Portrait of Mme Roger Jourdain. For a time the work belonged to the French silent film actor Max Linder (Maximilien Gabriel Leuvielle, 1883–1925).